The Great Big Home and Garden Show in Cleveland will be taking place at The IX Center starting this weekend, February 2-10, 2013. This show is one of the largest in the country. This is a fantastic opportunity to see all different venues for products for your home, your most important investment. You will be able to actually see and talk too many of the top landscapers and home improvement companies in Northern Ohio. You will also be able to experience their work first hand in the garden areas. What a wonderful trip on a cold winter’s day to smell and see spring indoors many months ahead of time! 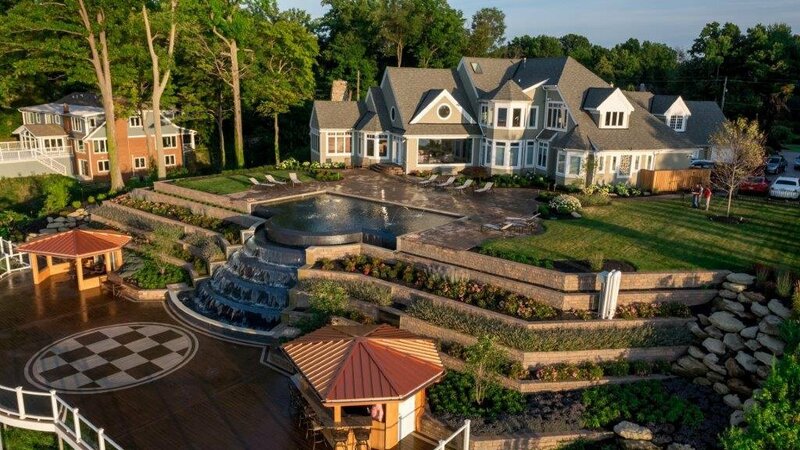 The landscapers compete against each other and install a variety of structures which include pergolas, patios, fireplaces, fire pits, waterfalls, fountains, seat walls, small bridges, outdoor kitchens, decks, pavilions, and landscaping. The landscaping will include evergreen and deciduous trees, perennials, flowering shrubs, and much more. This is a super time to see if there is a company that would be a fit for your project. This is also a time to pick up some ideas if you want to do it yourself. The landscapers have been preparing since late summer for this show. 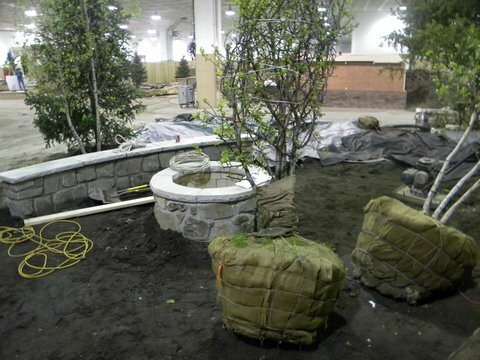 The show directors give the landscapers a theme and then each company designs a plan that must be approved. 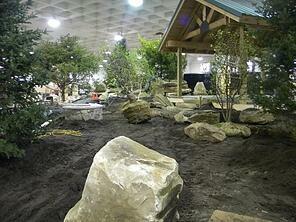 The show producers give all the landscapers a show floor layout and a chance to pick a garden size and location. Once that choice is made a more detailed drawing is made and the hunt is on! The companies need to order plants that will be cooled and forced to bloom or leaf out during the show in the fall. The landscapers then make a list of supplies needed and start collecting. We need to find large cut evergreens, boulders, steps, pavers, pavilion material, wall stone, tree stands, water feature supplies, moss, and other items needed to finish the display. Our crew will be collecting these items on and off throughout the fall and early winter. The sand that we use to build up the planting surface is provided by the show producer. A large piece of plastic must be put down for the sand to be place on to help prevent leakage after watering during off show hours. If the landscaper is building a structure now is the time to build the base. Many of the large cut and live trees are secured in place at this time and sand put around it. The sand and rock is carefully brought in and placed on the plastic without tearing it. 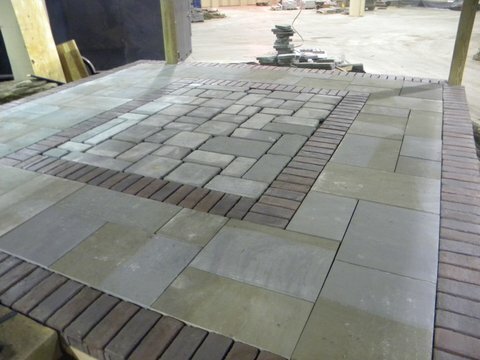 The installers now put in all the hardscape features trying not to damage the plastic on the cement IX floor. We have a good guess of what each piece of the display will take time wise. In the early days of the home shows we would only have four and one half days to set up! Now since we have a separate adjoining hall we have ten days to get it all finished. We usually have a schedule to plan everything out to get it done in time. Timing is critical because we must allow a final day for detailing the garden, which makes your garden look and feel real. During the eight days of the show the plants must be watered after hours, patio surfaces cleaned and wilted flowers picked so it is perfect for many more visitors. The last evening of the show there is a giant plant sale for the public. The sale is cash and carry. People bring their own wagons and wheel barrows to haul out their discount plants. Most of the plants that people buy will make it if they put them in a three season’s room or attached garage. Enjoy the show!